I'm pretty sure I've had a small vacuum leak since they replaced the oil pressure sending unit. A bit high cold idle and blowing air out of all the vents including defrost. I live in the boonies and the nearest auto parts store is an hour round trip away. I'd like to have the correct parts on hand, before I start. Can anyone tell me what size vacuum line material I'll need to fix, extend or replace the vacuum line that attaches to the rear of the intake manifold and then goes to the HVAC vacuum system? Is it soft rubber hose or the hard line plastic? Size? I've tried searching, but the forum's search function, well, pretty much blows. Even a google search couldn't find the size needed. 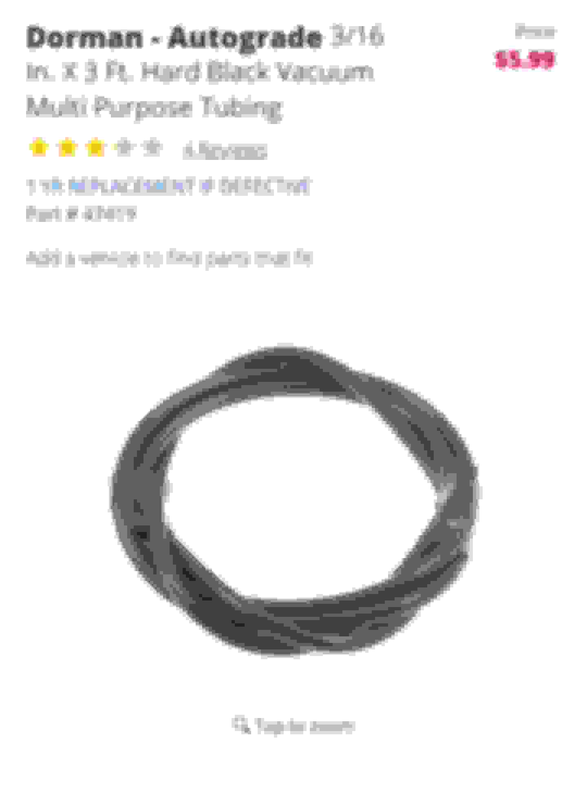 Its a hard plastic tubing. I'm not sure about the size though. Sorry for the half a** answer. Take a look back there. Yours may just be loose. If you remove the passenger side coil packs you may be able to reach back there and reattach or measure it. Well, s**t. No way someone with the nickname Big Hands Johnson, is getting a hand back in there, even with the coil packs moved. I guess I'll have to remove the fuel rails, then slide the intake ahead, and make the hose longer so i can attach it to the manifold while it's still in the forward position. Slide it back and hope it doesn't fall off. What a **** poor design to attach a simple vacuum line. I still don't know what sized tubing. I guess I'll buy a selection of each size and hope one of them is correct. The diagram for the vacuum system on a C5 seems to be DOD top secret. I've spent days trying to find one. Every time I think I'm getting close, I end up on the same web page for a C3 corvette. Last edited by jd911; 07-30-2018 at 09:38 AM. I would not recommend the rubber vacuum hose couplers/adapters from the parts store. Y'know, the selection in the Dorman HELP! package for a couple bucks? They are made of the worst quality rubber, and will crack/leak/fall apart in a year. Same with parts store rubber vacuum caps. Been there, done that, learned my lesson. Good luck!